Owen's Space Themed Birthday Party Mama Say What?! | Mama Say What?! Mama Say What?! 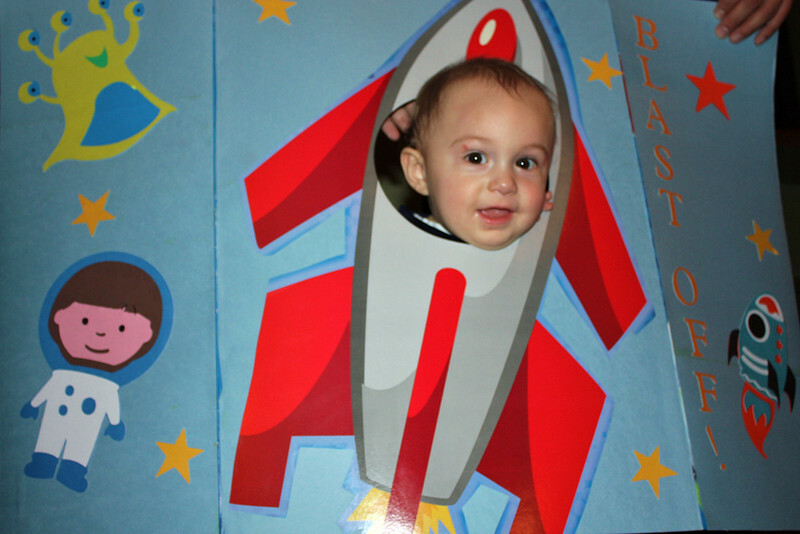 Mama Melanie threw an adorable space-themed party for her son’s first birthday. She put a lot of thought into his special day and it shows— just look at all the cute details and ideas she came up with! What inspired the theme of the celebration? I wanted Owen’s party to be something special and different. Owen is a pretty laid-back kiddo who loves pictures of the moon and stars so I thought that a space theme would be a lot of fun. 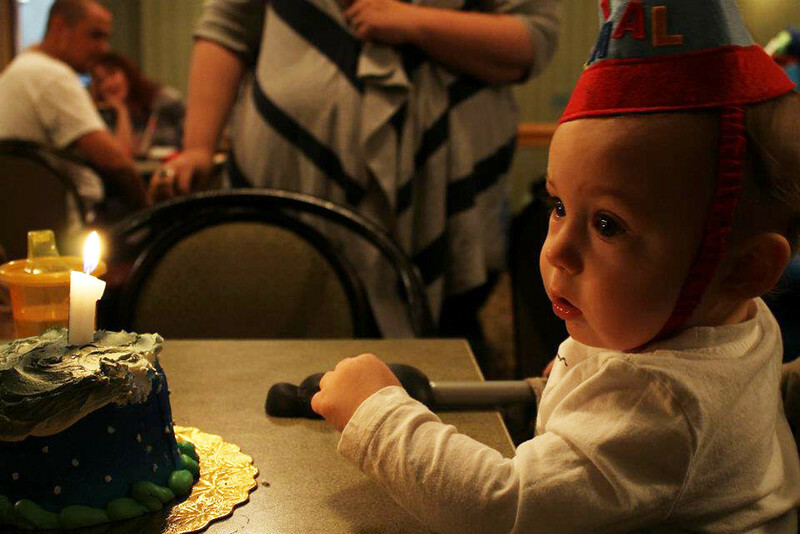 Because Owen had started daycare a few months before I went back to work, I had a few days a week to spend creating different aspects of the party. What was one element of the celebration that you are particularly proud of? I had found a cartridge for my Cricut that had astronauts. I decided that for a first party it would be cool to have a poster of 12 different astronauts, one for each month of his first year— I made circle cutouts of photos from each month so that guests could see how much Owen had changed throughout the year. It was a hit! If you worked with vendors – what did you love about them? I am an avid Etsy customer, and Sassaby provided a fantastic PDF file of the invitation we used—I could alter the invite to fit all of the party info as needed. It was sent to my email super quick, she was such a great seller! What was your favorite moment of the celebration? 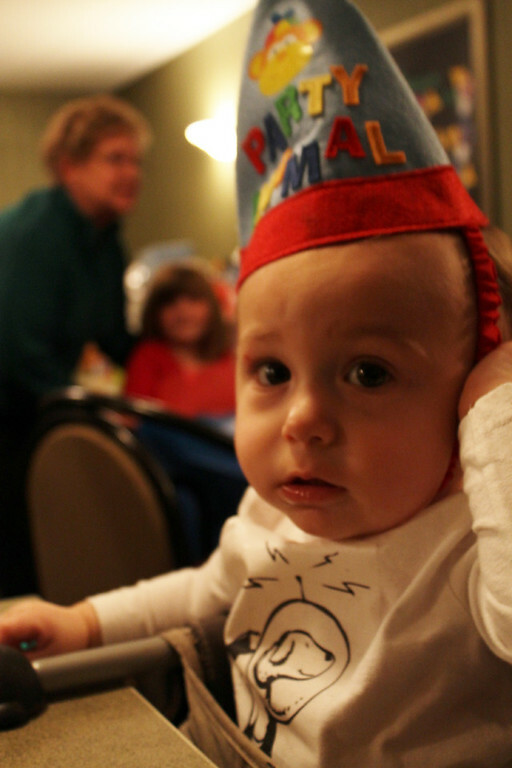 For me, the best part of the party was when my son walked into his first birthday party. He had started walking around the 9-month mark, so he was pretty confident in his walking and it was just the cutest thing to see him walk into his party, seeing all of his family and friends waiting for him. It sure made me realize how fast that first year had gone. What was Owen’s favorite moment of the celebration? 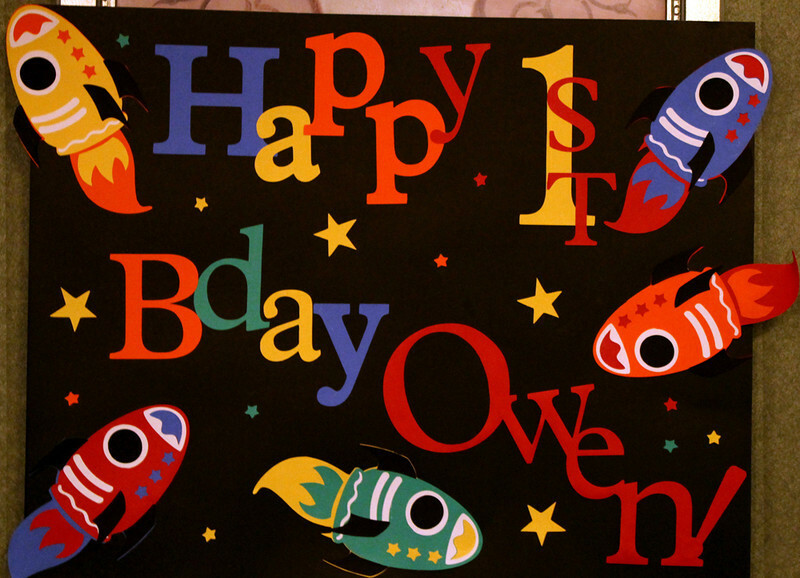 Owen got a kick out of his space ship cut-out. We wanted the kids to have a memory to have from the party and when Owen saw all the kids having their picture taken, he was all for it! They also appreciated (as did the parents) that I had a craft table to the side of the party where the kiddo’s could go and decorate their own spaceships and color. It gave the adults a chance to gab and the kids something fun to do. Each kid got their own special astronaut-in-training badge and I contacted the parents and asked for a pic of their child that I could attach to their badge. Is there anything you wish you would’ve done differently? If so, what? I don’t think I would have done anything differently. I think that when it comes to a party, the party guests don’t know what you do or don’t have planned and if something goes wrong, they won’t even notice. Enjoy the party! What advice would you give to other party planners? We were lucky that, at the time, my husband worked for a larger hotel chair in the city. 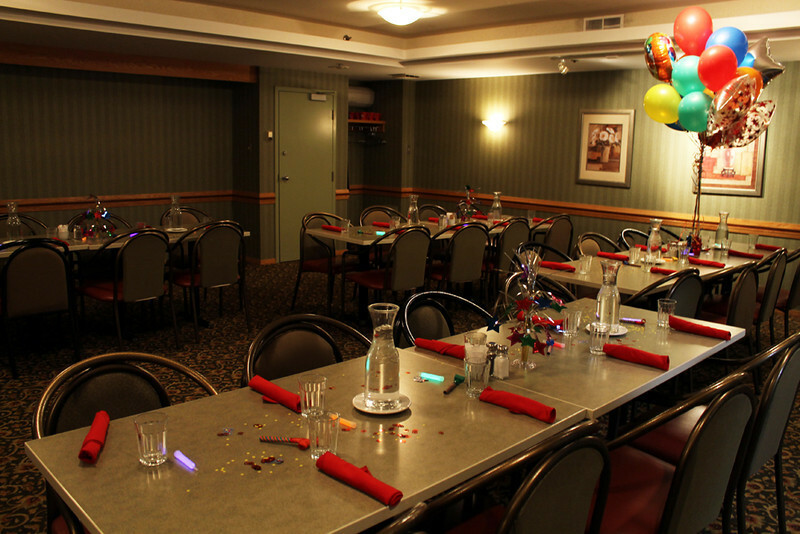 We rented out a party room and ordered pizza and drinks from their menu. Let me tell you, it was fantastic! You clean up what you brought, but you don’t have to vacuum or cook! 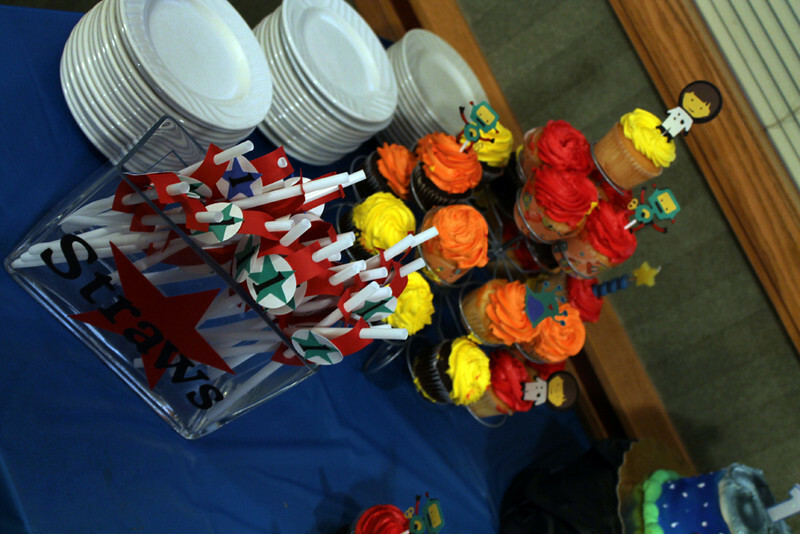 We brought the cake and cupcakes and all the dishes were done by the hotel. Think outside the box! it’s a lot more fun when you put your own twist on things! Added by Heidi C. on August 22, 2013. Very cool! That cake looks awesome too- looks like the galaxy?